Don’t count fluorescents out yet, argues Francis Rubinstein of Lawrence Berkeley Labs. The future of energy-efficient lighting, many experts will tell you, is the solid-state LED (light-emitting diode). You have already begun to see these tiny, bead-like lights in special applications such as traffic signals, exit signs, automotive headlights, and lightweight flashlights. Maybe you have begun to see them in high-end ambient room lighting applications, such as energy-efficient desk lamps and kitchen underlights. Paraphrasing from Nathan Lewis (of Caltech's Powering the Planet project), Rubinstein says: "We already have [light] coming out of everybody's [lighting fixtures]. This is not a new function we're seeking. It's a substitution. It's not like NASA sending a man to the moon. It's like finding a new way to send a man to the moon when Southwest Airlines is already flying there every hour handing out peanuts." Ongoing research at national laboratories and in the lighting industry is focusing on improving the light output, lifetime, and durability of LEDs, as well as driving their costs down. Many lighting experts expect that LEDs will eventually be used widely in general lighting applications, replacing inefficient incandescent bulbs, as well as energy-efficient fluorescent lamps (both the linear and compact varieties). 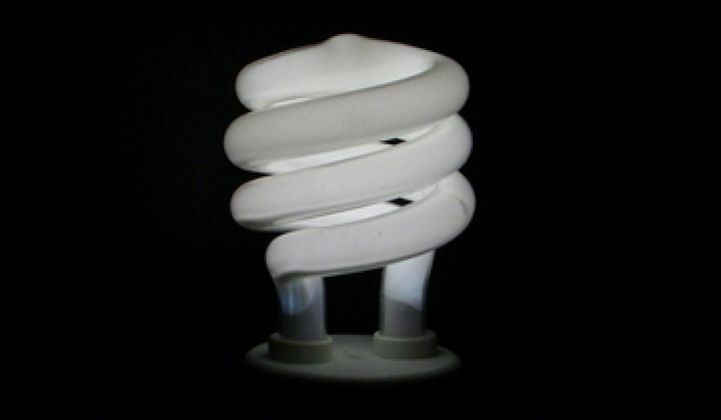 LEDs have the potential to be more energy-efficient than fluorescent lights. Rubinstein has been studying lighting systems in buildings for some thirty years. He has participated in energy efficiency improvement projects at the White House, congressional office buildings, the San Francisco and Oakland federal buildings, public and private buildings, and military bases. In his current research, much of which takes place in real buildings such as federal offices and large commercial facilities, he's been studying lighting systems combined with advanced wireless control systems, personal and workstation controls, and daylighting to manage the lighting needs of work spaces energy efficiently. In some recent studies, Rubinstein and his research team have installed an advanced lighting and wireless control system in a testbed on one or more floors of a building, monitored the energy use, and surveyed the user satisfaction with the new system. 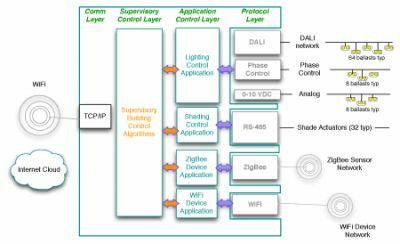 Such systems now on the market, or in prototype, use lighting industry standards such as BacNet and DALI, and leverage wireless protocols such as ZigBee and Wi-Fi. "Modern fluorescent lighting is the most energy-efficient, cost-effective source for general lighting available today," says Rubinstein. "Although solid-state LED technology has advanced, fluorescent lighting technology is also improving in energy efficiency and new features." Residential lighting is dominated by the Edison fixture, into which occupants screw incandescent bulbs or compact fluorescent lamps. There are about 4.5 billion of these in the U.S. In commercial buildings, there are about one billion linear fixtures and anywhere from two to three billion lampholder pair fixtures. "LEDs already have two strikes against them in this market," says Rubinstein. "They have to fit into an electrical infrastructure that isn't designed for LED replacements, and incandescent sockets work best with point sources such as the CFL or incandescent, while the fluorescent works best with line sources such as the linear fixtures everyone knows from office buildings." Although researchers are working to improve the performance of LEDs and drive down their cost, fluorescent lamp and fixture technology is not standing still either. The lighting industry, Rubinstein points out, has improved ballast technology in fluorescent lighting substantially. Figure 1. Improved ballasts and innovative fixture design have brought offices better efficiency and lighting distribution. Ballasts are the electronics that regulate the power flowing into the fluorescent lamp. Back in the 1970s, most fluorescent lamps used magnetic ballasts. 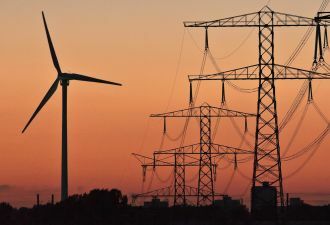 At that time, EETD researchers began developing electronic ballasts, which are 20 percent or more energy-efficient than magnetic ballasts, and they worked with the lighting industry to field-test and commercialize the technology. Today, the lighting industry has run with it. Manufacturers have introduced and improved the energy efficiency of instant-start ballasts, and they have introduced and increased the performance and efficiency of ballasts designed for dimming fluorescent lamps. The industry has also improved the light distribution efficiency of its fixtures (see Figure 1). Rubinstein has measured the fixture efficiency of 1990s-vintage parabolic louvered fixtures at around 60 percent. Current-technology recessed direct/indirect fixtures distribute 90 percent of the light coming from the fluorescent lamp into the space (see illustration). "My key point," says Rubinstein, "is that if you use LEDs to replace fluorescents, then you are on a battleground where cost is king, and the performance of fluorescents has slowly but continually improved over the years." LEDs have not yet caught up to fluorescent lighting in cost per lumens of light delivered -- they are sometimes ten times more expensive per lumen than fluorescent lighting, and in the lighting market, decisions about which technology to install are cost-driven. "We are so blasé about how good and cheap modern fluorescent lighting has become that we forget what a well-evolved technical tour de force it really is," says Rubinstein. Modern fixtures present lighting designers with the opportunity to adapt the lighting to the needs of the space. Adjustable features such as open wings allow certain fixtures to throw more light onto a ceiling and flatten the light out evenly, providing even illumination that is ideal for low-ceilinged rooms. Rubinstein argues that "until research drives the cost of LEDs down substantially, the greatest potential for improvements in lighting energy efficiency will come from combining advanced lighting controls with hybrid [fluorescent and LED] lighting systems, and designing the lighting to fit the space and occupant requirements in which they're used." Figure 2. Modern hybrid lighting combines fluorescents with LEDs to deliver pleasing ambient light and strong targeted light for tasks. 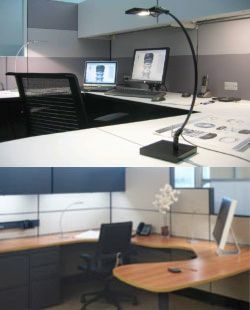 Figure 2 illustrates a hybrid lighting solution called task-ambient lighting, which some lighting designers are using more frequently. 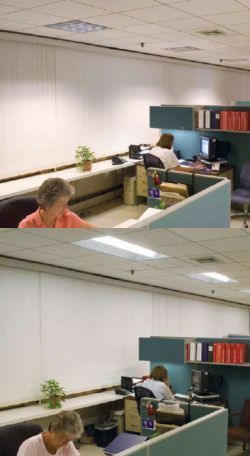 An overhead or undercabinet fluorescent fixture provides low ambient lighting to the pictured office, while an LED desk lamp provides task lighting to the office occupant at the desk and screen levels. But Rubinstein believes that the real future of energy-efficient lighting is in hybrid systems with control devices. "As time goes on we're going to get smarter and smarter, and develop smart furniture with built-in occupancy and light sensors. The sensors, as part of a larger automated building energy control system will reduce the energy we waste from lighting we don't need." Using a wireless lighting control system such as that pictured schematically in Figure 3, the lighting can respond automatically to increases or decreases in daylight coming through nearby windows if these are present; shut down and turn on automatically when office occupants leave and re-enter their office space; and even respond to the conditions on the electricity grid such as high prices or unusually high demand prefiguring grid failure (another technology known as automatic demand response). Figure 3. Wireless lighting control systems such as this Integrated Building Environmental Communications System (IBECS) communications network can respond automatically to ambient lighting conditions and other signals, to maintain optimal light levels while saving energy. An important component of this system will be personal controls. "Study after study has shown that lighting systems which give users personal control over the lighting in their work area results in saved energy," says Rubinstein. 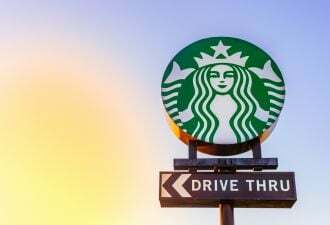 "They give users who don't want the full level of ambient lighting the option to set lighting at the level they're comfortable with." 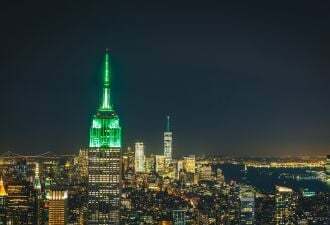 A study by Rubinstein in a federal building showed that occupant-responsive lighting and personal controls resulted in 40 percent less lighting energy use than an energy code-compliant baseline system that had low power density but was manually switched. By giving occupants control over their environment and the ability to adjust the overhead light level to their satisfaction, they make occupants feel happier with their surroundings -- despite other shortcomings in their environment. "Modern fluorescent lighting is the most efficient, cost-effective source for general lighting available today," he concludes. "Until LEDs become cost-competitive with modern fluorescents for general lighting, hybrid solutions are still the most energy-efficient lighting systems in the marketplace. And whatever lighting technology is used, the key to maximum energy savings and comfort is an intelligent control system that combines automatic with manual controls."